With the excitement surrounding the 70th anniversary, David is capping the number of available prints this year. He’s also including a special paper version (also signed and numbered) which will be only be available unframed. Outlaw motorcycle [clubs] might claim to be good ol’ boys who like to ride bikes, but law enforcement officers say that by definition, outlaw [club] members are involved in crime. Kevin Thom, director of the Attorney General’s Division of Criminal Investigation, said that he considers outlaw [clubs] to be organized crime. To keep track of [club] activity, DCI completes a report at the end of the Sturgis motorcycle rally tallying all contacts officers have with [club] members and gathering intelligence information. Officers note who is enrolled in which [club] and what roles individuals have within the [clubs]. The information is then put into a report a few inches thick and shared with 35 states and five foreign countries that have an interest in the information, Thom said. The information gathered this year will be used by DCI to prepare officers for the next year’s rally, Thom said. 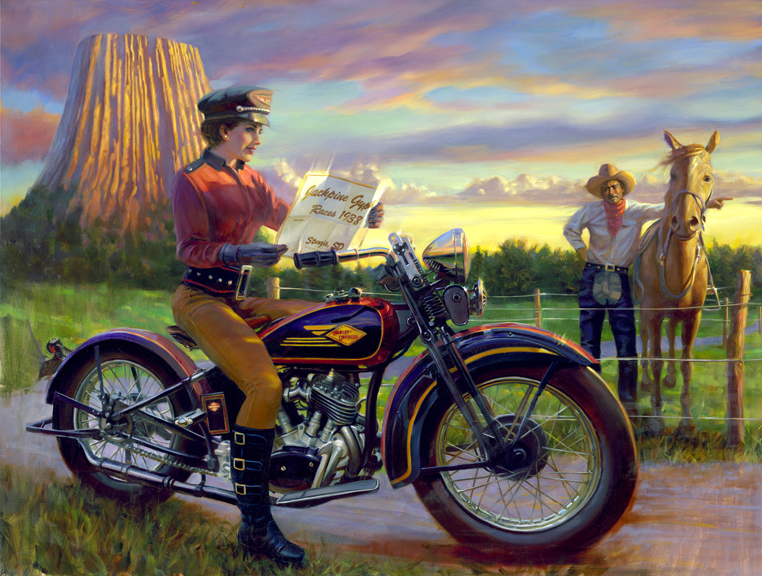 DCI puts together a Law Enforcement Safety Bulletin, a handbook of outlaw [clubs]’ identifiers and terminology, a timeline of violent motorcycle [club] involvement in South Dakota from 1981 to the present, and acts of violence nationally in the current year. Anyone picking a fight with one [club] member might get more of a fight than he can handle, West said, because other [club] members will join in. “Every one of them is loyal to those colors and that group,” West said. Law officers have been concerned in the past that [club] violence would erupt at the rally because of disputes between [clubs] in other parts of the country. In April 2002, a shootout between the Hells Angels and the Mongols in Laughlin, Nev., left three dead and 12 hospitalized. In February the same year, a fight between Hells Angels and Pagans in Plainview, N.Y., killed one and injured 10, according to the Associated Press. Authorities here were alert for signs of problems at the 2002 rally, but none occurred, Thom said. “Rivalries between [clubs] ebb and flow,” West said. Motorcycle thefts are big business for outlaw [clubs], and professional thieves work motorcycle rallies, Thom said. Law enforcement officers work to prevent thefts and recover stolen bikes, and representatives of the National Insurance Crime Bureau come here to try to identify stolen motorcycles and parts. Locally, the Bandidos is the only outlaw [club] with official chapters, two in the Black Hills and one East River. Hells Angels owns 120 acres north of Sturgis, and the Sons of Silence have a 10-acre campground seven miles north of Sturgis, Thom said. A Rapid City Bandido, Christopher Horlock, 44, turned himself in June 21 in Houston after being indicted with 25 other people in Seattle, the AP reported. Horlock, a national regional secretary for the Bandidos, was wanted on charges of conspiracy to tamper with a witness. Horlock’s indictment and arrest was part of an offensive launched by federal agents and police against the Bandidos after a two-year investigation, according to the AP. Authorities served arrest and search warrants in Washington, Montana and South Dakota. You may have seen my recent post about the V-Twin Expo in Cincinnati. I told you a bit about the winners of the V-Twin Awards and let you know that, despite weather and economic conditions, the show was its usual success. I had friends there that said it was a fantastic time. Well, I just got this press release in the mail that tells a bit about a round table discussion that took place during the event. I sure wish I were able to attend. I would have loved to hear what everyone had to say. Again, maybe next year. Despite having to make their annual voyage through wintery conditions that nearly shut down the entire East coast, a barrage of V-Twin dealers and exhibitors trekked their way to the 10th Annual V-Twin Expo in Cincinnati the weekend of February 6-8. The industry’s premier trade show, the V-Twin Expo is an opportunity for dealers and manufacturers to strike a deal and ascertain the overall state of the industry from veterans and colleagues. In addition to browsing an impressive array of V-Twin parts and accessories, this year’s expo also featured the “Eternal Combustion-Opportunity in the Wind” seminar. Sponsored by the Legendary Buffalo Chip and Hot Leathers, this round table gave audience members the chance to converse, listen and learn from an impressive selection of successful and established bike builders and discuss the current climate of the V-Twin industry. Turn out for the seminar was remarkable as an impressive assortment of industry giants discussed how they have managed to capitalize on their passion within the current climate and how they have successfully turned difficulty into opportunity. The seminar was moderated by celebrated motorcycle photographer, Michael Lichter and the panel consisted of industry notables Kevin Baas, Bryan Fuller, Brian Klock, Gary Mauer, Dave Perewitz, Matt Olsen, Kirk Taylor and Paul Yaffe. An overwhelming sense of passion for the industry permeated the room while journalists, industry insiders, dealers, manufacturers and builders discussed the industry; how it has changed since starting out, how to adapt to these changes and refocus business as well as how to pass this passion down to the next generation of bike builders. At the conclusion of the seminar celebrity moderator, Michael Lichter also revealed the theme, participants and the logo, designed by Hot Leathers, for the 10th annual Motorcycle as Art exhibit to be displayed at the Legendary Buffalo Chip August 7-13. Titled “Eternal Combustion- 30 in the Wind” this year’s exhibit will focus on the explosion of interest and passion for custom motorcycles seen over the last thirty years. The display will include 30 custom motorcycles from 15 pairs of custom builders and will feature the photography and limited edition prints of the renowned photographer. This internationally renowned and highly anticipated yearly exhibit will be on display at the Lichter Exhibition Hall on the grounds of the Legendary Buffalo Chip August 7-13. An opportunity to peruse, mingle, discuss and learn this year’s V-Twin Expo and highly anticipated “Eternal Combustion-Opportunity in the Wind” seminar was the perfect opportunity for those involved in the V-Twin industry to rekindle their passion for the business and introduce this years Motorcycles as Art exhibition. More information on the free Motorcycles as Art 2010 Exhibition, “Eternal Combustion-30 in the Wind” is available at motorcyclesasart.com and buffalochip.com.